When we think of hyperactivity and the brain, we usually think about children and the diagnosis of attention deficit hyperactivity disorder. Though this is one of the results of a hyperactive brain, it's not the only one--and brain hyperactivity is not limited to children. Adults can also be symptomatic. 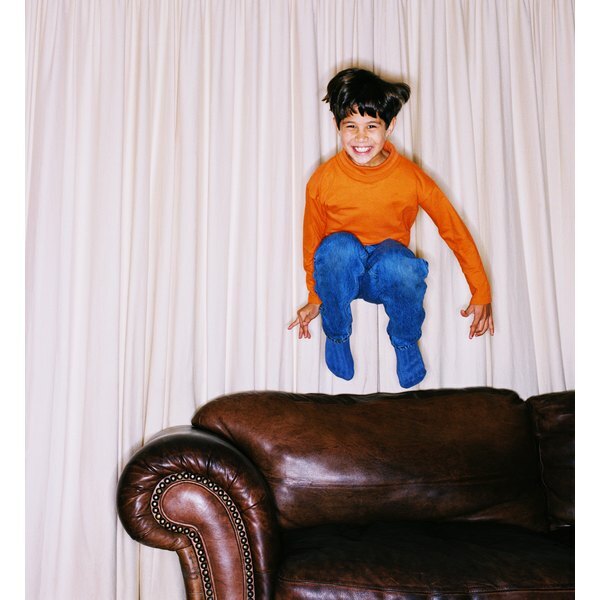 Hyperactivity of the brain can significantly affect the daily lives of children and adults. It can lead to mental health disorders such as ADHD, oppositional defiant disorder, anxiety disorders, learning disorders and depression. The National Institute of Mental Health reports that research found thinner brain tissue in areas of the brain related to attention in children who were hyperactive and carry a certain gene. Sometimes people who have suffered a brain injury develop symptoms of hyperactivity that were not displayed before the injury, according to the NIMH. Symptoms of a hyperactive brain can be seen outwardly. These behaviors can include fidgeting, squirming, needing to walk around, excessive talking, interrupting, inability to remain on task, trouble coping with stress, mood swings and lack of focus, according to the surgeon general. Adults with a hyperactive brain tend to reduce their excessive motor movements as they age. According to the Mayo Clinic, people who present with hyperactivity tend to display less brain activity in the area that controls attention. Cigarette smoking and alcohol use during pregnancy have been linked to hyperactivity in the brain, as reported by the NIMH. Also, there is increased support for the influence of genetics in hyperactivity. Researchers have been studying the importance of several genes that make people more likely to develop this symptom. Additionally, exposure to environmental toxins has been linked to hyperactivity, as reported by the Mayo Clinic. People with hyperactivity experience: poor school performance, problems at work, substance abuse and addiction, frequent accidents, repeat problems with the law and lack of success in relationships, according to the Mayo Clinic. One of the best things you can do to deal with a hyperactive brain is to speak with your doctor regarding your symptoms. Medication in the treatment of hyperactivity has demonstrated positive results, but your doctor should be consulted before you begin this regimen. Also, the use of mental health therapy in conjunction with medication or alone has helped people deal with their symptoms. Common therapies in use are cognitive behavioral therapy and family or relationship therapy, the Mayo Clinic says. If you aren't ready to attend therapy or want additional support, support groups may be a great avenue for you. Also, you should open a dialogue about your symptoms and feelings with those you are close to. This could help to improve your relationships because they will have a fuller understanding of you and what you are dealing with.